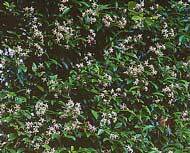 This evergreen twining vine grows to 6m (20'). The dark green leaves and fragrant Jasmine like 2-Scm (3/4-2") creamy white flowers which yellow with age, make this species an excellent choice for a patio plant. A sheltered sunny location is best although they will tolerate partial sun.